The first horizontal-axle windmill was constructed in Europe during 1137 at Leicester while 14th Century Dutch windmills were mostly used in draining areas of the Rhine River delta. By 1900 there were around 2500 windmills in Denmark, working as pumps or mills for doing sundry mechanical jobs. By 1850 to 1900, Midwest America saw windmills in their millions that were mostly installed in farms and ranches, drawing water for agricultural purposes. Among the famed suppliers were Aero-motor, Fairbanks-Morse, Eclipse and Star. The first wind powered mill or windmill for generation of electricity goes to the credit of Prof. James Blyth of Glasgow whose 33 feet high, cloth sailed wind turbine was set up in the garden of his holiday cottage at Marykirk, Scotland in July 1887. It was mainly used to charge accumulators and then to power the lighting in his cottage. Although Prof. Blyth offered the surplus electricity generated by his wind turbine for lighting up the main street of the town, the local residents had naively turned down the offer since they considered electricity as “the work of the devil”. During 1887-88, Charles F. Brush of Cleveland, Ohio had designed and built a heavier and stronger wind turbine that was installed at his home and was in operation from 1887 until 1900 when it fell into disuse as electricity became available from Cleveland’s central stations and eventually the whole idea was abandoned as “mere wastage of time and energy”. In the same year, Poul la Cour, a Danish scientist constructed wind turbines to provide power for producing Hydrogen. During the first quarter of the 2oth Century, wind power became a significant part of a decentralized electrification issue in Denmark. Later, in 1956, Johannes Juul built a 24 meter diameter wind turbine and installed it in Gedser that had a fairly long operational period starting from 1956 and ending in 1967. Innovative ideas and working plans in America during the end of 1920 made many firms internationally famous. Brothers Joe Jacobs and M. Jacobs opened their factory in Minneapolis in 1927 by the name of Jacobs Wind that produced more than 30,000 small and medium wind turbines some of which ran for years together without any fault even in vastly remote locations like Africa. Some of their turbines found their place on the Richard Evelyn Byrd’s expedition to Antarctica. During the thirties, wind turbines were extensively used in the US to generate electricity where proper distribution systems were yet to be achieved. The most used small wind generator produced for farms in the US was a two blade horizontal-axis turbine made by the Wincharger Corporation that had a peak output of 200 watts. The turbine’s blade speed was ingeniously regulated by curved air brakes located near the hub that prevented excessive rotational velocities. With the beginning of the 21st century, a dramatic change swept over the world, making people search for all forms of renewable energy to replace fossil fuel that had already caused enough damage to the environment. Global warming, CO² concentration, excessive air pollution made governments and public bodies provide incentives to people using renewable energies like solar and wind power. As photovoltaic cells are stille beyond the reach of common man, people rushed for small, pocket-friendly wind turbines that can be installed in one’s roof or windows where there is some amount of breeze available. Wind Parks located slightly away from cities now provide wind powered electricity to city dwellers, thanks to contemporary power transmission lines. Do you want to make your own electricity? Yes you can do this and that too cheaply and easily. 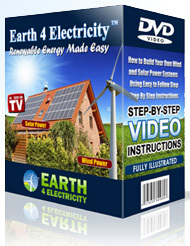 Set up your personal wind power system with the help of this manual that will tell you where to set it up in your home and how to do so. The manual will also guide you step by step on wiring the system and also help you find the parts cheaply. Plus the manual also tells you about the safety precautions. By installing a wind power system you can not only clean up the air, but also reduce your power bills to a great extent.